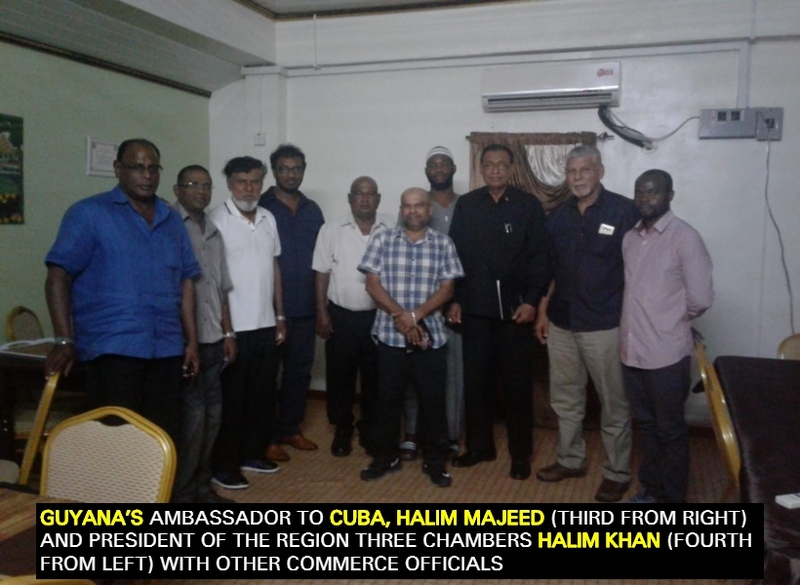 Guyana’s Ambassador to Cuba, Halim Majeed yesterday met with Region Three (Essequibo Islands-West Demerara) Chamber of Commerce to discuss participation in the upcoming trade fair in Cuba. The fair is being held from October 29th to November 2nd, at Expo-Cuba Exhibition site. During his visit, Ambassador Majeed noted that the Guyana Embassy in Havana has already begun planning for the Havana International Trade Fair (FIHAV) and the Cuban Chamber of Commerce has already sent Official Invitations to Go-Invest, the Georgetown Chamber of Commerce, the Guyana Private Sector Commission, and the Region Three Chamber of Commerce through the Guyana Embassy in Cuba. The envoy also noted that the Guyana Embassy has contacted a number of Guyanese companies with the objective of getting them to take part in FIHAV 2018. He said Guyanese had participated in FIHAV 2016 and FIHAV 2017 with great success. President of the Region Three Chambers, Halim Khan proposed government assistance in the form of airfare to Cuba for participants or assisting with the taxes to be paid on the tickets, since airfares are not cheap. “If it was not for the Region Three commerce participation last year, Guyana would not have had a booth or representatives to showcase its products,” Khan noted. He explained that discussions also surrounded trade with Guyana, Cuba, Central and Latin America countries. Further, the Chambers President said he will work with Ambassador Majeed to ensure Guyana’s products are well marketed along with Cuba’s assistance to market tourism and agriculture in region three. “Most farmers don’t want their children to become farmers, but they want them to be doctor or other professionals and one way to boost agriculture is to offer incentives to Cubans who want to be in the field of agriculture, they can be given the lands to work for a stipulated time and apply for residency if it is deemed they have the potential to grow and expand,” Khan noted.